Holidays in Skopelos unfolds an unforgettable tasting experience especially when you taste the local salads, such as the salad with feta and dakos. The recent years the famous Greek choriatiki salad appears in lots of new exciting versions. Concerning the salad with feta and dakos, the addition of Cretan dakos rusks makes a great difference to your usual choice by being more filling yet not heavy. It is better enjoyed as a side dish or as a light lunch or dinner after a long day discovering the island’s magical beauties. See here how we make our salad with feta and dakos and you might just have found your new favourite taste during your holidays in Skopelos. First of all we place the Cretan dakos rusks on the plate. Next we cut the fresh tomatoes and place them on the dakos rusks. Soon after we add fresh onion and fresh parsley. Next we add a few olives, capers, feta cheese and on top extra virgin olive oil. 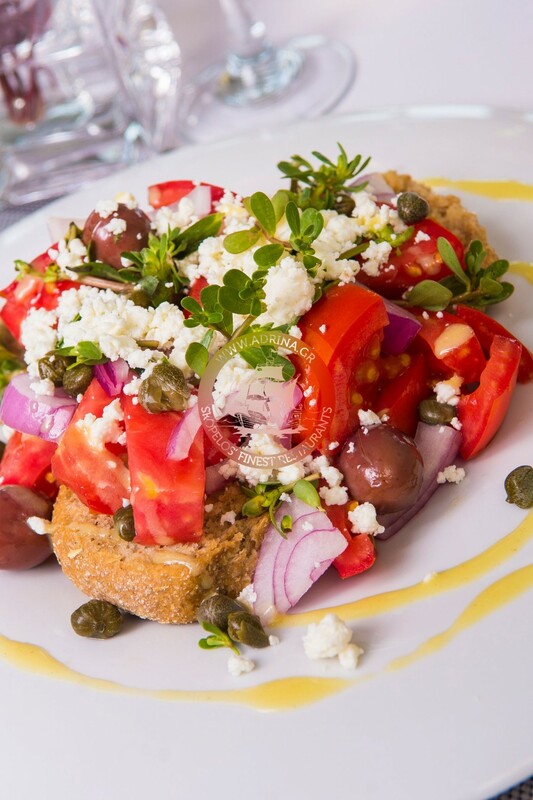 The salad with feta and dakos is very much enjoyed with a glass of wine or Greek ouzo. The tastes mix together beautifully making you ask for more! If you want to recreate this salad at home just remember to select dakos rusks from Crete, since there lies the origins of these specific rusks. Do not miss out on the olives and the capers since they add a tasty twist to this recipe. Taste the magic for yourself by ordering salad with feta and dakos and allow your holidays to Skopelos to present you a new exciting gift of taste.